"Prepare to be inspired" is a slogan of the group hosting a four-day gathering downtown for future engineers, scientists, professors and technology leaders. The FIRST world championship involves 700 teams of 15,000 young robotics designers and programmers from across America and 44 other countries. 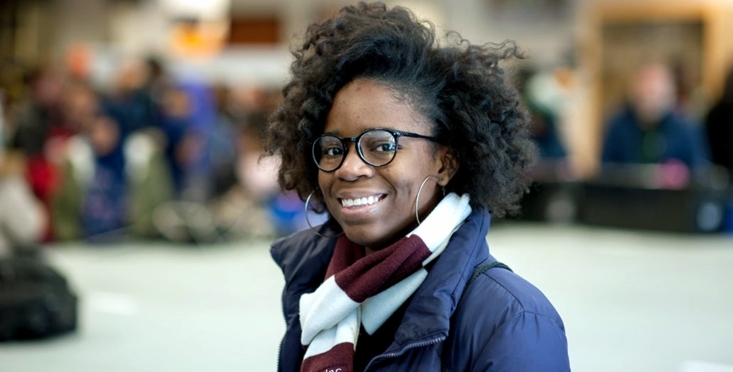 "We're so excited to be here in America's comeback city, celebrating STEM and innovation," the host organization posts Wednesday as students wearing safety glasses set up tents and booths in Cobo Center "pit areas." Competitions start Thursday. Three days of judged events are the peak of a 16-week season when high school students prototype, build, program and operate robots to complete a task that increases in difficulty at each level. Elementary and middle school pupils compete in less sophisticated LEGO League challenges. The event draws over 40,000 participants, including coaches, mentors and parents. Michigan in well-represented, including by the Az-Tech Eagles team from Caesar Chavez Academy in Southwest Detroit. Foreign participants come from China, United Kingdom, Russia, Germany, India, Spain, Ireland, Poland, Sweden South Korea, the Netherlands, Jamaica, Romania, Croatia, Taiwan and elsewhere. In addition to workshops, conferences, gaming, scholarship information booths and an Innovation Faire showcasing business sponsors, the schedule includes a three-hour Ford Field welcome party Thursday evening with live music, digital graffiti walls, a giant interactive Lite-Brite, photo booths and a silent disco where dancers use wi-fi headphones or ear buds. Cobo Center displays a first-time sign. Recreation opportunities nearby include activities for attendees and the public at Beacon Park, Campus Martius, Grand Circus Park and Capitol Park -- such as robot-assisted games, "the world's largest game of PacMan," virtual reality headsets, dancing robot demonstrations and live music "using cutting edge technology advancements." Awards will be presented at a two-hour Ford Field ceremony Saturday night. Detroit is the international championship site again in 2019 and 2020. Among local sponsors are GM, DTE Energy, Quicken Loans, Ford, Visit Detroit and the FCA Foundation of Auburn Hills (formerly the DaimlerChrysler Corporation Fund). FIRST, the nonprofit organizer, was founded in 1989 and is based in Manchester, N.H. Its name means For Inspiration and Recognition of Science and Technology, and its goal is "to inspire young people's interest and participation in science and technology, and to motivate them to pursue education and career opportunities in STEM fields." It serves students from kindergarten through high school. First Tech Challenge entrants Lama and Sabriyah (right) of St. Paul, Minn., are on the "Ponytail Posse -- which calls itself "an all-girls team with an ironic lack of ponytails." These young robotics engineers from Romania are on Team 14277 QUBE. Members of the Jamestown Robowolves from Rhode Island are state champs in the FIRST Lego League. This quartet is from the Republic of Croatia on the Adriatic Sea in Europe. This U.S. team's white board says: "We, the girls, bring to the team organization and beauty. On our team, there is a girl captain and more important positions. We believe that girls and guys are equal. GIRL POWER!" A trio of overseas entrants find their homeland on an inflated globe. The Cobalt Colts, a First Tech Challenge team of eighth, ninth and 10th graders from Overland Park, Kansas, say on their white board: "How to FIRST Like a Girl: • Break stereotypes • Innovate • Lead • Add sparkle!" Foreign competitors set up in trhe event's "pit area" at Cobo Center. Springfield, Ill., students wear initials of the team name: These Are the Droids You Are Looking For."